Composer and multi-instrumentalist Rachel Flowers first touched the piano at the age of 2 1/2. Actually, she hit the piano. With a hard plastic toy. This event was immediately followed by her first piano lesson. Growing up in the San Diego area, Rachel enjoyed a rich and varied musical life. As an infant she was often present at her parents’ band rehearsals and performances. Trips to hear family friends play the local coffee houses and visits to the Spreckels Organ Pavilion were regular occurrences. Folk, country, rock, classical, jazz… Indian, Japanese, Indonesian music could all be heard in and around the Flowers home. 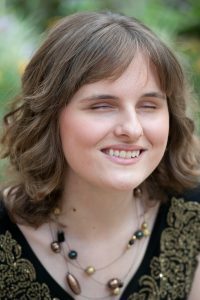 At 4 1/2 years old Rachel began her formal music training through the Southern California Conservatory of Music where she studied piano, music theory, ear training, music history, and Braille Music, and spent time learning jazz standards after hours. This was later supplemented by courses at The Academy of Music for the Blind, private flute lessons, and private instruction in advanced jazz improvisation through the Thelonious Monk Institute of Jazz. When she was 9 years old Rachel and her family moved to Ventura County, where she still resides. In middle school and high school Rachel played the flute with the concert band and marching band, along with the county honor band. She also learned to play the saxophone and mallet instruments. Other notable events during her high school years include scholarships for the Sacramento Traditional Jazz Camp and Stanford Jazz Residency, finalist for two years in the Los Angeles Jazz Spotlight competition, 2nd place and then winner of the Ventura County Student Jazz competition, and too many ribbons, medals, and trophies from flute competitions to name here. Upon graduation Rachel was presented both the Semper Fidelis award for outstanding musicianship, and the John Philip Sousa award. Once she graduated from high school, Rachel was free to explore even more creative possibilities. She taught herself to play guitar and bass, and through Braille Institute she learned to play the ukulele. She also started performing in local jazz clubs. Even more important, she blossomed into a prolific composer. The year 2014 brought about a life changing event when film director Lorenzo DeStefano came to hear Rachel perform at a local jazz club. From that initial meeting came nearly two years of filming, and completion of a feature length documentary. Hearing is Believing enjoyed a successful run in film festivals and screenings throughout the country and is now available on DVD and BluRay, plus Video On Demand. The accompanying soundtrack album is available as well, and features 5 of Rachel’s original compositions, plus covers of pop, jazz, and classical pieces, and collaborations with grammy winners Arturo Sandoval and Dweezil Zappa. Now 24 years old, Rachel has also released her debut album, “Listen.” Each piece was composed, performed, and recorded by Rachel. Combining elements of classical, jazz, and rock, “Listen” gives us our first glimpse of all the music that has been brewing inside Rachel since that first time she played “Twinkle Twinkle Little Star,” barely able to reach the keys.